These versatile large-diaphragm mics offer great performance on a budget. Sitting between the vast swathe of 'your name goes here' Chinese microphones and the more established international names are a number of companies who use some Chinese parts — specifically capsules and body hardware — and then add electronic circuitry made to their own design. One such company is US manufacturer ADK, whose mics seem to have won plenty of friends in the various audio forums on the strength of their performance in the studio and their affordable price. ADK's philosophy seems to be to create a unique tonal character for each model, but I've found that they don't tend to stray so far from neutral as to restrict their potential applications, and although the A6 and S7 reviewed here are primarily aimed at vocal recording, they are both pretty versatile. 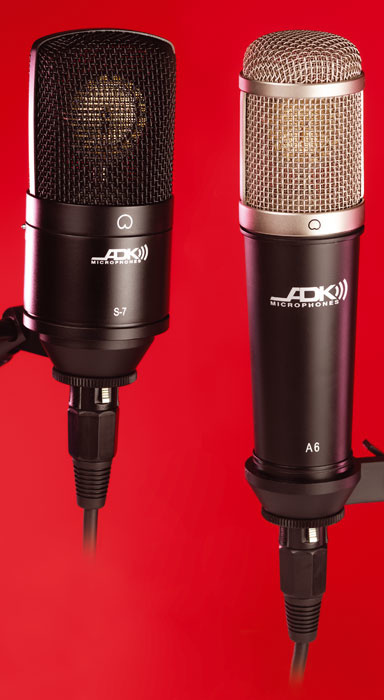 ADK's A6 model is a conventional side-address, large-diaphragm, capacitor microphone that has a cardioid pickup pattern and no pads or filters (presumably to simplify the signal path). A cardioid logo, engraved on the front of the basket housing, denotes the hot side of the mic. As supplied, the A6 comes in a rigid, black, wooden box, with a stand mount (but no shockmount) that fits onto the bottom of the mic via a locking ring. The external standard of finish is good. 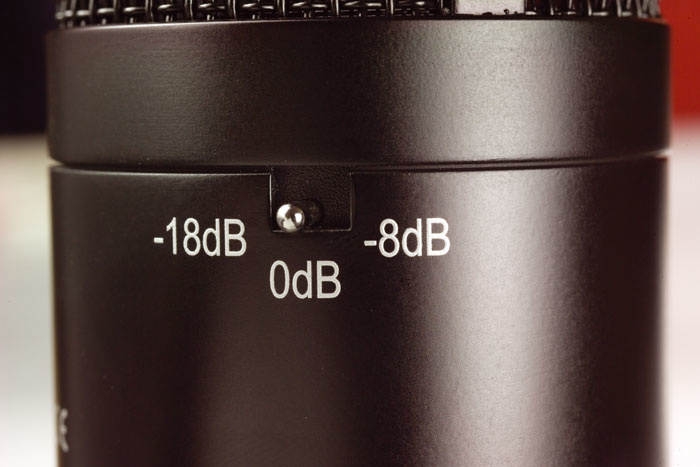 Few technical details are available, other than noise and sensitivity (EIN 15dB A-weighted, sensitivity 13mv/Pa), although we do know that it has maximum SPL handling of 131dB and requires a nominal 48V phantom power source. The information sheet that comes with the mic comprises a single piece of paper that's almost entirely taken up with the warranty details, but it does volunteer that "the ADK A6 has been designed to be reliable and robust, with a relatively neutral sound coloration" and that it employs class-A circuitry — but this, of course, is used in the vast majority of capacitor mics, so that doesn't really tell us much. Suggested applications include studio vocals and voice-overs, brass, percussion and drum overheads. Hammond organs also get a mention (but, strangely, no Farfisa or Vox models...). Unlike the A6, ADK's S7 includes a switchable low-cut filter and pad.There's no obvious mechanical ringing when you tap the body or basket, which is just as it should be. Unscrewing the threaded retaining ring at the bottom of the mic allows the lower half of the case to slide off, exposing the circuitry — whereupon it becomes apparent that this is a FET design feeding a balanced output transformer. The mechanical components are very recognisably Chinese in origin, but everything seems well put together, with all the circuitry neatly laid out on two glass-fibre PCBs. A tough metal grille protects the capsule, which seems to be a little over one inch in diameter (1.08 inches seems to be a popular size). For my main test, I used the A7 to record vocals via a Universal Audio Solo 110 preamp, with the mic placed a couple of inches behind a perforated metal pop-shield and suspended in an Audio Technica shockmount that just happened to fit it perfectly. The mic captured a subjectively accurate sound, with only a hint of added presence, although the singer on this particular session managed to make the mic pop slightly on a couple of occasions, despite the shield. A low-cut switch may well have helped here, but moving the singer a little further from the mic did the trick. As suggested by the manufacturers, this microphone has a subjectively neutral sound, with the transformer helping to smooth out the high end, and it also proved to be a versatile all-rounder in my tests. Constructed in a similar way to the A6, the S7 is, by comparison, a somewhat squat-looking mic. Like the A6, it is supplied in a hard box with a rigid stand mount, and technically it is similar too, with a large-diaphragm capsule and class-A FET circuitry, although this time there's a transformerless output stage. The S7 has a fixed-cardioid pattern, but, unlike the A6, also features a switchable low-cut filter (with flat, 100Hz and 150Hz positions) and a pad (offering 0, -8 and -18dB settings). No popping was evident when the mic was used with a pop shield and the low-cut filter was in its 100Hz position. Neither of the mics generated any audible level of noise in normal studio applications. Although the S7 has been designed to add a high-end sheen, it isn't harsh: when I tested it with a singer who tends to have a somewhat abrasive voice it actually sounded pretty smooth, while keeping a nice sense of air and breath. If I had to ascribe a character to the S7 it would be smooth and airy, but not over-bright or strident-sounding. As I mentioned earlier, this mic is aimed primarily at studio vocals, but a number of secondary applications from strings and acoustic guitar to brass, drums, percussion and guitar cabs are also suggested by ADK, and with a maximum SPL handling of 150dB, when the pad is switched in at its -18dB setting, there isn't much that will scare the S7. Conversely, with sensitivity of 12mv/Pa it is also quite sensitive enough for recording quieter acoustic instruments. I'd have liked to see more technical detail on these mics — frequency response plots, for example, would have been helpful — but judged on a purely subjective basis, they work just fine. Competition is, of course, very fierce in this sector of the microphone market, but both these models offer a very good level of performance for the asking price — and I can't see anyone being disappointed with the way they behave. Although there are lots of other worthy mics, including many of Chinese origin, in this price range, it would seem that ADK deserve their reputation for providing quality at an affordable cost. The alternatives list in this price range could end up as long as the review itself, but a few that spring to mind include the Audio Technica AT2020, sE Electronics 2200A, Rode NT1a and Rode NT1000, as well as similarly priced models from Studio Projects, MXL and Sontronics. Confident sound that flatters without adding excessive coloration. Two very affordable large-diaphragm cardioid condenser microphones that offer good performance given their prices. A6 £146, S7 £160. Prices include VAT. Smart Sound Direct +44 (0)845 869 5155.